The Nurse and the Jester | Welcome to Poesies.com! Today I will venture into an overdone and fairly maudlin subject -- my dogs. I have two female Italian Greyhounds, and they are the second pair that I have owned. 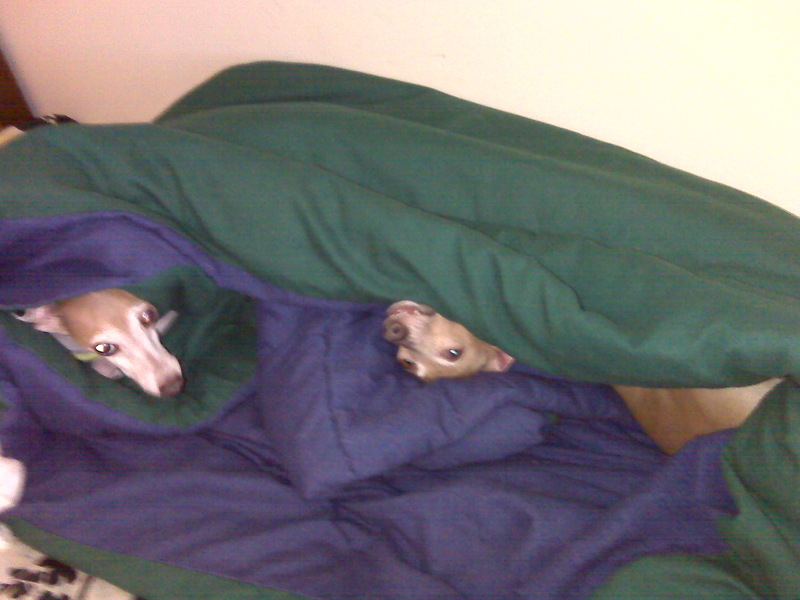 I chose Italian Greyhounds because, well, face it, they are the cutest dogs ever. Besides that, I am allergic to everything under the sun, and their fur is short and they don't create much dander. Also, they are an ancient breed that is about 2,000 years old, and I'm a sucker for stuff with a history. And the beauty of their sleek design cannot be denied, as with all sighthounds in general. But let me tell you about something that I found out only after owning them. They are the most sensitive and compassionate dogs I have ever known. This makes sense, actually, because they are the only dogs that were bred specifically to be companions for humans. Every other breed, even toy breeds, were created for a different purpose, whether that purpose be for hunting or keeping watch, to herd, or even for food. 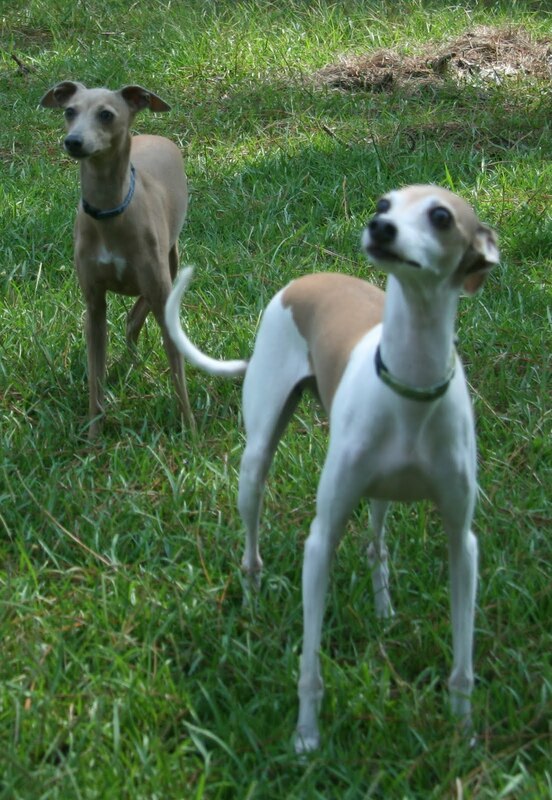 Italian Greyhounds were bred in what is now Turkey to be harem dogs. Being a highly sensitive person and what Dr. Judith Orloff calls an empath, I am as attached to these tiny hounds as they are to me. And their personalities are extremely different, and each serves a special emotional purpose to me. She has always tucked her front legs under her when she lies down, which adds to her deer- or lamb-like appearance. When I am sad or frustrated or somehow otherwise besotted with a negative emotion, Felly always comes over to me, wagging her tail apprehensively. She is careful and very sensitive to angry outbursts and loud noises in general (forget about thunderstorms, she turns into a quivering mess! ), but she always wants to help with a face lick or just a cuddle. She is in their bed in that photo. It's a comforter that I've sewn together folded in quarters so that it has many pockets for them to cuddle up in to keep warm. IG's get cold very easily. Go figure, they were bred in the desert. 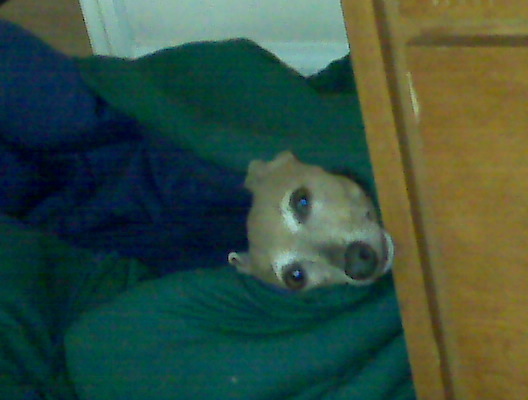 Anyway, I was working at my desk, and I looked over, and there Artie was poking her head around the corner just looking at me. Luckily the cel phone was within reach to get the pic. What other amusing things does she do? Well, she groans. When you go to pet her or adjust her if she's on your lap, she groans like a human. I can't figure out whether it's a groan of pleasure or annoyance -- maybe it's both. Either way, she isn't upset when she does it. And she is the most inquisitive dog in the world. If there is a corner, she will be there looking for something in it. If there is a blanket or a jacket or anything new in the house within her reach, she will be either under it or on top of it. I remember when we brought them both up to visit my in-laws shortly after we got Artie. We were all sitting down to eat in the dining room, and Mom was getting the main course out of the kitchen. Next thing we know, there is a puppy on the table. Artie had jumped straight up from the floor and landed right in the middle, where the main course would be. On her face was sketched this priceless "uh oh" look. We put her down and scolded her a bit, but mostly we were all trying very hard not to laugh. She's never done it again. But to this day, I can always count on Artie to put a smile on my face... just for being Artie. Felly: "Oh hi, how are you doing? Are you happy? Do you need to pet me?" Artie: "Ooh, what's that rustling over there in the bushes? Maybe it's a bird and I can chase it halfway across the yard before I remember that I'm afraid of birds." I'm quite sure that without these little animal friends, I would not have come nearly so far in such a short amount of time in my emotional healing of my fibromyalgia and my PTSD. 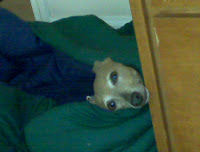 I will always have Italian Greyhounds in my life.